Those of you, who finish reading this blog, will receive information many companies don’t want to tell you or just don’t know how to do. Furthermore, your sales both repeat and referrals will increase, your branding will dominate across the web through all of the social media sites, you will have published positive reviews that stick, and your search engine optimization (SEO) value will be stronger than ever. As I travel across the country helping automotive dealerships improve sales and retaining their customers I am exposed to many theories about how to win the battle for market share. The battle is usually lost by many because there is no strategy involved. I will talk about this later in the article. Therefore it is necessary to pay attention to how you are managing your Online Reputation. Before we discuss how to help your online reputation, we need to identify what Online Reputation is. Online Reputation is the individual, consumer, business or products perceived reputation identified on the World Wide Web recorded by reviews, blogs, websites, social media platforms, and the media. Individuals over the age of 37 will understand this simply as reputation. However, with the invention of the web, we have become more sophisticated and added online because all of the information is available at our fingertips. Once businesses figured out their reputation can be researched by anyone online they either turn to a so called “online reputation expert or manager” or try themselves to assist with cleaning or keeping clean their reputation. The problem is that because the knowledge is foreign to many dealership principles or general managers, the dealership is susceptible to malpractice. A bad online reputation will cost you money! Online Reputation Management (ORM) is the practice of understanding or influencing an individual or business brand. It was originally coined as a public relations term, but advancement in computing, the internet and social media made it primarily an issue of search results. Although it is often associated with ethical grey areas such as astro-turfing review sites, trying to censor negative complaints or using gamey SEO tactics to influence results, there are also ethical forms of reputation management, such as responding to customer complaints, asking sites to take down incorrect information and using online feedback to influence product development and other insights. Let’s be very clear before you read on. If you are looking for a company that is offering you a quick fix, if you refuse to offer great service and a good product, or want to deceive consumers than you WILL NOT want to read further. I am not in the business to mislead our consumers. I am in the business to help businesses share with the world how great their company and product is. If that is you, then you will want to continue to read. Online Reputation is NOT just about reviews although it is a major factor for businesses that rely on consumer opinion. Online Reputation is built by having a presence throughout the World Wide Web. •Strong Locals such as Google and Yahoo (there are over 150 you should be aware of) that are accurate and completed in their entirety to maximize local searches. These local sites will also help consumers identify correct reviews. •Blog Pages (There are many, and they all index differently) This is the same as a newsletter that you share with your customers, but now you are able to share with the world about your company and information about your product or service. •Social Media Sites that focus on videos. Almost everyone has heard about YouTube, but what about other sites such as MetaCafe and others? Videos index greater on places like Google and are an inexpensive way to share your message 24/7. •Social Media Sites like Facebook, LinkedIn, Google Plus and more (new popular sites are developed every day) which thrive on content. •PR Blog that you can share with the world extraordinary events that you would love for mainstream media to pick up and share with the world. •A well-built website that has basic stuff like a really good Title, Meta, Alt, and Text optimized for any of the search engines. There are more requirements in building a great website such as where to place the phone number, and others, but these are some of the basics. •XML site map and HTML site map. Google and Bing (Yahoo) only except XML. You will want to have all of your sites easily found by all of the search engines. Strategy is often overlooked when building your Online Reputation. There are several steps you will want to take to make it easy for you to manage your reputation. A house will not stand if you do not have a strong foundation. The same goes for your Online Reputation. •Make sure your dealership message is consistent across the interest. We have found in some markets Yahoo is more effect than Google. And don’t ever count Bill Gates out. Bing powers a lot of the Social Media Searches along with the Automotive Mobile Navigation Systems. •Focus on a sound sales process. A positive customer experience not only helps with positive reviews, but it will increase your gross. •Keep everything the dealership does transparent. If you hide something that means you are up to no good and in this day and age you will get caught. And getting caught will do more damage than a bad review. Do you remember the Dealers that made 20/20 in the early 2000s? That was just ugly! •DO NOT – again – DO NOT forget about Yelp. Yelp has had a few problems and there have been some allegations of extortion by both the company and yelpers themselves. But Yelp is a player and isn’t going away. It’s almost like a cult. If it hasn’t hit your market yet it will. •Provide an avenue for your customers to review your business the right way. Read below for information on how to get reviews the right way. •Develop strong Customer Loyalty. I will talk more about this later in the article. •Utilize Web 2.0 to allow all of your sites to communicate your story to the world. Acquiring Google+ Reviews and Having them Stick! If you have knowledge of how Google works then that makes you the Billion Dollar Man or Women. The Google Secrets are guarded better than Fort Knox. If you are not able to crack the Google Code then how could anyone offer advice to car dealers or any business on how to get all of the reviews to stick? The fact of the matter is only the chosen few know exactly how any of it works and I would bet not one person knows it all. Let’s address the IP Myth. Think about this; take any given company for example Texas Instruments. Do you really thing Google will block or identify Texas Instrument’s internet gateway (the point where TI accesses the internet), please… that would impede 25000 plus users from using their products and services. I believe that it is based on usage of the account. If the account is active and a Google+ has been created then the reviews will stick no matter the content. Why you might ask? Because it’s a real person, it doesn’t matter where the review is generated in my opinion; it matters on how Google+ is used. There is nothing wrong with offering the client a choice to give an honest review while in the dealership. Again the keyword here is “OFFERING”. However, don’t stop with just Google. Offer a whole host of sites for the client to post a review or even better allow the client an area to write the management/owner a personal note about their experience. A personal note a lot of the time has a bigger impact on store processes. For example, we have a program that allows consumers to post good and bad reviews before they leave the dealership. This allows dealers to address issues and identify the good and bad before the customer takes their business elsewhere. Are Reviews about playing “Gotcha” or are they designed to INCREASE CONSUMER SATISFACTION? I believe Google, Yahoo, Yelp, and other sites were created to ultimately provide the latter. As with everything, there are businesses that practice unethical behavior which affect us all. In most cases, if you are using a good vendor or doing all of these things yourself correctly, then your business will not be punished. If you are not doing it right then you deserve what you get. Avoid using services that offer to create Google+ Local reviews based on customer survey data, online forms, or personal customer correspondence. With all of the legislation that has been implemented opens the dealer up to a huge liability factor. Check out the FTP site to see possible fines that can occur if caught. Many of the reviews will not stick especially in Google+, but there are a lot of vendors that still practice this. Many of these companies claim to have IP jumpers, MAC Address changers or even proxy server access. Believe me that’s 100% wrong. It doesn’t work for long. How do I know? Because I had the opportunity to partner with several companies that would collect and post reviews this way. It did not look, feel or smell right so my business partner and I developed a program to help dealerships and other companies to build their Online Reputation the Right Way. “If it looks like a duck and sounds like a duck…it must be a duck.” in the … (BTW: a lot of posting are made at coffee houses by these types of companies). Do not assist or encourage customers in creating a Google account to post a favorable review on your Google+ Local business page. If you encourage or assist a client on any matter which can be considered an endorsement and not disclaim it is highly illegal and the fine can be in upwards of $250,000 for a first time offense. There is nothing wrong with ask them to jot down a few words on how there car buying or service experience was. A lot can be learned from this action which can hugely benefit the dealership, client experience, and ultimately Consumer Satisfaction. Carl Sewell once told me, “If you take what your clients have to say to heart guess what Profits will increase!” Carl Sewell obviously wrote the best seller, Customers for Life. Inspect your Google+ Local business page to monitor the reviews that are being posted. Make sure that all of your business information is correct on a weekly basis. Many dealerships either do not have time, or become very depressed when they do look at their pages. Don’t be an ostrich and stick your head in the ground! Your issues will not go away without doing something about them. If you are Marketer provide this service for your clients coach them on how to address the client in a public forum. Every business make mistakes, but taking the easy way out and ignoring the post is ludicrous. We are a forgiving society, and consumers are human. We want to do business with “real companies that care”. If you do not maintain your local pages (notice pages) you are loosing out on market share. There 100’s of local networks and you never know which one people will use. You must make sure your message is consistent on each site. Marketers this is a new opportunity to provide a much needed service the automotive dealer. The only thing you can or should do is ask the client for a review good or bad with no strings attached. You just might find a hole in the sales process that can be fix which will provide the client with a better experience. When you make small adjustments to the sales process improving the client experience profits increase! Bottom line, Google+ is the new thing on the block and everyone is worried about how to use it. Remember Google created millions of errors during the transformation and minimal Google users (people that use Google for Gmail only) will not convert over to Google+ to write a review. Most users have spent years developing their Facebook network and don’t really want to move over and start anew. True, Google is the 800 pound gorilla, but don’t get caught up in all the hype. Apply sound digital marketing practices and you’ll be fine, or as my grandmother told me “Watch your Ps and Qs”. Google has huge issues right now and it is going to take them a very long time to sort them out. If you were one of the Dealerships that feel Google removed legitimate reviews with out your consent email us and we can send you information on how to start legal actions in addressing this issue. Email us at sales@DeliveryMaxx.com and put Need Help with Legitimate Reviews in the subject line. We will have one of our technology specialists help navigate the proceedings. If your Online Reputation Management needs help and this is a service that you would like us to give you a comprehensive overview then put Automotive Digital Marketing Done Right in the subject line. Creating Customer Loyalty is the easiest way to get positive reviews and build your Online Reputation! If you have read this far, then you are serious about your business. I commend you, and you are probably a partner in the dealership or one day you will be. Business really is simple. A good product, fair price, and outstanding customer service separate your company from the competition. The customer wants to spend their money where they feel valued. If you are putting the customer in the vehicle that is right for them at the price that is right then you will have a satisfied customer. However, if you thank them for their business, and welcome them into your family they will become your customer for life. So how do you do this 100% of the time? It starts with you. Set an example throughout the dealership and identify your expectations. •You have to have a Customer Friendly Culture. •Develop processes to communicate with your customers where they are. We know that 80% of your customers are on the web, but what about the other 20%? Combined an electronic follow-up as well as traditional follow-up system. •Consistently follow-up with your customers during happy times such as birthdays, holidays, and annually after the delivery of the vehicle. Let the customer know you still care about them long after they have left the dealership. •If you have a Service Department, create ways of getting your customer back into your dealership to experience your customer service. •When you make a mistake (and you will), do your best to make it right. Good luck selling and we look forward to seeing you at the top! If you are a true GEAR HEAD... this will bring a smile to your face. “A successful company creates jobs, jumpstarts the economy, and allows all of us to pursue the American Dream” states James Schaefer, Chief Operating Officer of DeliveryMaxx. Schaefer explains, “The facts are simple. A small business that was developed, and financed with our own resources has led to jobs for 15 employees and the opportunity to spend their income on goods and services that employ others as well. As our company grows, so do opportunities for others.” “It is the ‘multiplicity effect’. It is not about the haves and have-nots! It is about opportunities created for all. Small business owners take personal risk after identifying advantages, perceived or otherwise, and if successful provide jobs, family vacations, medical care, and educational opportunities for future generations. If a father or mother is able to bring home income they are able to provide these things for their children.” Schaefer points out during one of his Small Business Summits. The constitution states that we all have the right to pursue “Life, Liberty, and Happiness”. It does not guarantee us “Life, Liberty, and happiness.” So why are businesses, no matter the size, made to look like evil empires by some media outlets? Why do some politicians stir up emotions of some that they are entitled to these rights? The word “Pursue” is left out of this argument all too often, and that has created a “fundamental war” between the “haves” and “have-nots”. Mr. Schaefer gleams about the business partner he found in Co-Founder, Josh Deaton. Mr. Deaton has taken on the role of Chief Executive Officer for DeliveryMaxx. Mr. Deaton’s story is a story like many other great American business owners. Josh grew up very poor in the small town of Anna, Texas. He lived in a trailer home most of his life with his mother and various step-fathers. His mother was married five separate times, and his birth father spent many years in federal prison. Deaton was determined to pursue a different life, and break the chains of poverty. While in high school, Josh would wake up early in the morning and sit in the middle of the field taking site of Doves that would fly into the sites of his shotgun. If successful, he would provide dinner for him and his family. Once he saw the bus kicking up the dust from the gravel road about two miles out, he would place the gun back in the house grabbing his school supplies for a nine hour day of learning and athletics. He was a star athlete in basketball and football, but Anna High School was too small for any major college to take notice of him. When it was too dark to see, Josh resorted to fishing in the dark at a nearby pond or lake to continue providing food for his family. All odds were against Josh. His mother was on disability. His Father was in prison. His step-fathers were drunks, abusive, or both. Mr. Deaton’s, step-grandfather and uncle was a positive role model for him. They both were accustoming to working hard and instilled those values into Josh. At the end of high school, Mr. Deaton joined the United States Marine Corp which he considered an honor to serve his country. Mr. Deaton’s leadership qualities were quickly noticed by the Corp where he became a Guide and ran his Platoon during training. Deaton was honored as the top in his class with the highest rifle and pistol scores in the division. He quickly rose to the rank of Corporal where he led his platoon as Platoon Guide. Mr. Deaton then was asked to try out for the C.Q.B. (Close Quarters Battalion) where he was honored to train with the FBI to protect National Security. However, adversity struck Josh’s family again when he learned that his mother had suffered a severe debilitating back injury in an automotive injury, and was unable to provide for the family. Mr. Deaton was given an Honorable Discharge from the military and came back home to provide for his family. Without much formal education, despite having an IQ of 144, Mr. Deaton learned masonry and other manual skills resulting in laying tile in many upscale homes. Josh was able to see some of the finer things in life, and knew that he wanted to provide those things for his family. After purchasing a vehicle from a dealership in the Dallas, Texas area, he inquired about working as a sales person. He knew that with a lot of hours, hard work, and the mindset for treating customers’ right, he would be successful in the automotive industry. Deaton’s outstanding automotive knowledge and managerial achievements have been honored by industry and business leaders, including one of the largest publicly traded automotive companies in the world, Sonic Automotive. Deaton was named “Best of the Best” in 2005 as their highest valued and most respected Manager in the organization. Deaton worked at Lute Riley Honda, one of Sonic Automotive’s premiere dealerships. He held just about every position including consecutive “Salesman of the Month”, Top grossing Business Manager, Top Grossing Sales Manager and voted “Best of the Best” as the New Car Director. While in-charge, Deaton implemented a unique process that increased revenue, CSI scores and Sales, putting Lute Riley Honda at the top of the charts. In doing so, Lute Riley Honda won 2 consecutive Presidential Awards which are only awarded to the top dealerships for Honda. This is the equivalent to winning the Super Bowl and to do it two years in a row is a top feat in itself. During his time at Lute Riley Honda, Mr. Deaton hired, trained and motivated a staff of 76 people. Within 2 months Lute Riley Honda rose from the number 6 to the number 1 volume dealership in the state of Texas. Within 6 months of Mr. Deaton’s leadership, Lute Riley Honda ranked within the Top 10 highest volume dealerships in the United States. Lute Riley Honda profits were the highest in the company’s history along with a system to put Lute Riley Honda in the top 5% of the 1000 Honda dealerships in the Nation for customer satisfaction. Because of this exceptional achievement, Lute Riley Honda was awarded the President’s Award 2 years in a row. This award is given to the elite dealerships that rank in the top 10% nationally for their high customer service scores compared to all of the Honda dealerships nationally. Mr. Deaton was named “The Best of The Best” by Sonic Automotive. Sonic Automotive (SAH) is recognized worldwide as the leader in the automotive industry. Their organization owns more than 120 new- and used-vehicle dealerships and 25 collision repair centers in 15 states. Lute Riley Honda was Sonic Automotive top performing store under Mr. Deaton’s leadership. Deaton loves a challenge and wanted to see if he could do the same thing at other dealerships. He was offered the position of New Car Director at David McDavid Honda of Frisco. His first month at the helm, the dealership went from ranking number 15-25 in volume to number one in the State of Texas, beating Lute Riley Honda and at the same time winning the prestigious Presidents Award again. Soon the dealership was ranking in the top 5 highest volume dealerships in the United States. During his time in the automotive dealership world, Josh was able to invest most of his earnings into startup companies giving yielding him capital to pursue the dream of owning his own company. Josh now brings the same leadership and vision, which made him successful at the dealership level, to DeliveryMaxx, providing outstanding services to the entire automotive world. DeliveryMaxx provides dealers with cutting edge technology that ensures that the dealership is getting maximum exposure and creating a long lasting bond with their customers. This will keep them as customers of the dealership for life! Before DeliveryMaxx was born, Mr. Deaton was an investor in an International Marketing Company that James Schaefer was a Senior Level Executive. James’s story took a little different path than Josh’s, but was based on many of the same life learning lessons.He was the son of a German Immigrant, who had come to the United States just after World War II. Mr. Schaefer’s father’s family had lost everything in the war including a private college in Cologne, Germany. Mr. Schaefer’s father had grown up in a very similar situation that Josh had grown up. “I think that is why Josh and I get along so well. I can relate to Josh, because that is how my father grew up” Mr. Schaefer often tells business associates. His father did not have anything given to him in life having to work road construction in Houston, Texas throughout high school. “His best clothes were a pair of jeans without holes in them and a white t-shirt that was not dirty.” James’ father earned a football scholarship to Stephen F. Austin State University after playing high school football for one of the famous Coach Bear Bryant’s Junction Boys, Coach Bobby Marks. His father turned to a life of education, coaching, and ministry to help young people plan and pursue their dreams. However, a life of service to others did not provide the riches Mr. Schaefer desired in his youth. One day while helping his father dig a drainage ditch he answered to his father’s demand of learning manual trades that, “I plan to make enough money that I don’t have to do this for a living!” Mr. Schaefer always knew he would become an entrepreneur. In the ninth grade, he secured many lawns with a reality company and employed several of his high school classmates to help him maintain this business. His knack for understanding simple economics led him to open up one of several businesses that revolved around customer service and advertising. After becoming a 1996 graduate of Stephen F. Austin State University with a major in Political Science and Minor in Business Mr. Schaefer has been employed with Universal Technical Institute (UTI), Alta Colleges, and Combustion Media. He has started four companies in addition to being a Co-Founder of DeliveryMaxx. Universal Technical Institute is the leading provider of Technical Training in the fields of Automotive, Diesel, and Collision Repair. UTI has entered into partnerships with NASCAR, Mercedes Benz, Audi, Porsche, Ford, Toyota, Lexus, International Trucks, Volvo, Nissan, and Volkswagen. They have a sales force of 270 representatives responsible for the growth (enrollments) of UTI. During his tenure with UTI Mr. Schaefer has served as a Field Sales Representative, Change Leader, and Regional Sales Director and as a result has acquired experience in sales, management, training, public relations, marketing, human resources, and an understanding of the vocational need in America. He received many awards year after year as one of the top representative, and when in management his team of representatives became one of the top teams in the organization. His last position with UTI was as a Regional Admissions Director. (Left to Right)In 1999 pictured is James Schaefer, UTI Director; Richard Younker, Park Place Porsche; Patrick Stanberry, BMW of Dallas; Tim Minor, Sewell Lexus are all former students of Mr. Schaefer. They are living the American Dream. After leaving UTI, Mr. Schaefer accepted a position with Alta Colleges as a Regional Director of Admissions quickly becoming a leader within the organization. Alta Colleges even designed their assessment test for managers after Mr. Schaefer because of his leadership qualities in motivating and turning around underperforming sales teams. In his short tenure, Mr. Schaefer earned multiple awards and being appointed to the Leadership Counsel. Alta Colleges is a for profit educational institute specializing in CAD, Graphic Design, and Computer Science. Alta Colleges offered Mr. Schaefer a Vice President of Sales position, but he declined to embark on a new challenge outside the education industry. Mr. Schaefer accepted a position as the Vice President of Sales with Combustion Media. He quickly moved up within the company into the role of Senior Vice President of Sales and Marketing as well as the Secretary of the Board of Directors. During his tenure with Combustion Media, he led the organization through an unprecedented growth and into the Social Media arena and Professional Sports Marketing. Through his business negotiations he was involved with some of the world’s business and political leaders such as Steve Forbes, Senator Mitchell, Alexander Muse, Jack Furst, and then Governor Mitt Romney. Senator George Mitchel and James Schaefer speak at Leadership Conference in Washington D.C.
Schaefer started his first company at the age of 19 while a sophomore in College selling advertisement to local businesses and giving him a taste of successful entrepreneurship. Before the internet, Byron Consultants utilized the power of cross marketing to consumers driving business sales. At 21 he sold Byron Consultants and started Sweet Remembrance with Victoria Bates who later became his wife. Sweet Remembrance was a catering company which allowed parents to have cakes, birthday, holiday, and exam packages delivered directly to their students who were studying in college. His key role was to negotiate strategic partnerships which were accomplished by securing Wal-Mart and Stephen F. Austin State University as partners. Again, the concept was new and innovative during this time. He capitalized on a need and provided a great service. In 2007, Mr. Schaefer started CarSch Enterprises and Byron Thomas Holdings which specializes in providing hair products and grooming services for Men. It was only a matter of time that Mr. Schaefer expanded his portfolio. Never one to rest on his laurels and his drive for making a difference in the world he co-founded DeliveryMaxx. With the introduction to Mr. Joshua Deaton’s vision of a customer retention program; he seized the opportunity to help develop what is now called DeliveryMaxx! When Mr. Deaton and Mr. Schaefer sat down at one of their many late night meetings to discuss the development and future of DeliveryMaxx, they were determined to make the company one of the “Greatest Places to Work”. They based their decisions off of their life’s experiences, and were determined to overcome adversity and obstacles that they continue to face today. Starting a new company is difficult. Starting a company in a billion dollar market and competing against companies with over a hundred million dollars in revenue can seem monumental. However, both gentlemen rely on their faith, family, and work ethic to climb the mountain of success. Therefore DeliveryMaxx was financed 100% by Mr. Deaton and Mr. Schaefer. This was not done without much sacrificing from both men and their families. To minimize personal expenses, Mr. Deaton sold his beautiful upscale home taking a hundred thousand dollar loss due to the depressed housing market and moved into a much more modest neighborhood. They explained to their kids that eating out was a luxury and found ways to make potatoes and rice into a gourmet meal. Josh talks passionately about the meals he came up with. “If DeliveryMaxx didn’t work out, I would have a great career as a chef for the middle class and less fortunate. I should start a cookbook and watch it jump to a best seller!” he states with a chuckle. James’s kids have learned that luxury’s like ESPN and top cable TV shows would only be able to be viewed from the internet once the recordings were released. “My kids thought the biggest sacrifice we made was cutting our cable where we only watched a couple of channels together that was part of the $9 a month package” James says with a smile. Both men who claim that their family is God’s biggest blessing to them turn to more outdoor, church, and school activities to spend quality family time. “Even when we reach the top of the mountain that we are climbing, we will continue to maintain a balanced and family oriented life. Of course that mountain will never stop growing because we always loved to be challenged” they both state. From the beginning, Mr. Deaton and Mr. Schaefer established a mission statement that is still governing the company today. DeliveryMaxx is committed to quality work and superior customer service in all aspects of our business. Our mission is to be EVERY Dealerships choice and any other entity to provide innovative tools to help retain customers for life. That meant allowing employees to have flexible work schedules, and encouragement to put family and public service first. Furthermore, DeliveryMaxx created a fair wage schedule that allows every employee to be financially rewarded as the company grows. Each account that is added and all revenue that is earned are shared amongst all active employees. As the company earns more, so does every employee within the DeliveryMaxx organization. This concept has empowered every employee at DeliveryMaxx to help make decision that will better serve their clients. DeliveryMaxx has developed a comprehensive program from a dealerships perspective. They have done this because over 95% of their employees have spent some part of their careers in the automotive industry, and mostly at the dealership level. “That’s right, our employees have sold cars, worked the desk, penciled deals, closed the gates, ported cars, bought and sold at the auction, and gone bell to bell weeks at a time. Our employees have been General Managers, Internet Directors, Sales Managers, Managing Partners, Marketing Directors, Business Development Managers, Human Resource Directors, Service Advisors & Managers, Trainers, and Sales People participating in the automotive industry” Josh says with pride. DeliveryMaxx was formed to help businesses, particularly the automotive industry, an opportunity to show appreciation to their consumers for making these purchases. DeliveryMaxx creates a Social Media Marketing program (SMM) to publically thank their customers on a daily basis. Included in this marketing program, DeliveryMaxx is able to increase Search Engine Optimization (SEO) value, Online Reputation Management (ORM), and help businesses acquire positive reviews and branding. The end result utilizing DeliveryMaxx's Images of Success program is an increase in customer loyalty and satisfaction. This program is truly a complete comprehensive automotive dealership consumer care program. DeliveryMaxx captures dealership customers' image at the point of delivery and markets that exciting time to the world helping dealerships create customers for life. Because DeliveryMaxx has become one of the fastest growing Automotive Service Vendors they have been able to provide jobs for many individuals. They have created real opportunities for parents to be able to help their kids go to college, buy school supplies, and ability to partake in some form of entertainment. Thus, the “multiplicity effect” is in full swings. When these parents pay for school supplies those who make those school supplies and sell them are able to provide for their families. When DeliveryMaxx employees entertain their families, others are able to continue to provide earning income and increasing their spending. Both Josh and James spend many hours talking with today’s political leaders about obstacles for small business today. Mr. Deaton, and Mr. Schaefer remain steadfast in helping the economy. They strongly believe that small businesses have a direct effect on employment rate and consumer confidence. Consumer confidence is an economic indicator which measures the degree of optimism that consumers feel about the overall state of the economy and their personal financial situation. How confident people feel about stability of their incomes determines their spending activity and therefore serves as one of the key indicators for the overall shape of the economy. In essence, if the economy expands causing consumer confidence to be higher, consumers will be making more purchases. On the other hand, if the economy contracts or is in bad shape, confidence is lower, and consumers tend to save more and spend less. A month-to-month diminishing trend in consumer confidence suggests that in the current state of the economy most consumers have a negative outlook on their ability to find and retain good jobs. Investors, manufacturers, retailers, banks and government agencies use various assessments of consumer confidence in planning their actions. The ability to predict major changes in consumer confidence allows businesses to gauge the willingness of consumers to make new purchases. As a result, businesses can adjust their operations and the government can prepare for changing tax revenue. If confidence is dropping and consumers are expected to reduce their spending, most producers will tend to reduce their production volumes accordingly. For example, if manufacturers anticipate consumers will reduce retail purchases, especially for expensive and durable goods, they will cut down their inventories in advance and may delay investing in new projects and facilities. Similarly, if banks expect consumers to decrease their spending, they will prepare for the reduction in lending activities, such as mortgage applications and credit card use. Builders will plan for the decline in home construction volumes. The government will get ready for the reduction in future tax revenues. On the other hand, if consumer confidence is improving, people are expected to increase their purchases of goods and services. In anticipation of that change, manufacturers can boost production and inventories. Employers can increase hiring rates. Builders can prepare for higher housing construction rates. Banks can plan for a rise in demand for credit products. Government can expect improved tax revenues based on the increase in consumer spending. •Represent 99.7 percent of all employer firms. •Employ about half of all private sector employees. •Pay more than 45 percent of total U.S. private payroll. •Have generated 60 to 80 percent of net new jobs annually over the last decade. •Create more than half of nonfarm private gross domestic product (GDP). •Supplied 22.8 percent of the total value of federal prime contracts in FY 2006. •Hire 40 percent of high tech workers (such as scientists, engineers, and computer workers). •Are 52 percent home-based and 2 percent franchises. •Made up 97 percent of all identified exporters and pro­duced 28.6 percent of the known export value in FY 2004. •Small innovative firms produce 13 times more patents per employee than large patenting firms, and their patents are twice as likely as large firm patents to be among the one percent most cited. Source: U.S. Dept. of Commerce, Bureau of the Census; Advocacy-funded research by Kathryn Kobe, Economic Consulting Services, LLC, 2007, Federal Procurement Data System ; Advocacy-funded research by CHI Research, 2003, U.S. Dept. of Labor, Bureau of Labor Statistics, Current Population Survey; U.S. Dept. of Commerce, International Trade Administration. How many new jobs do small firms create? Over the past decade, small businesses created 60 to 80 percent of the net new jobs. In the most recent year with data (2004), small firms accounted for all of the net new jobs. Firms with fewer than 500 employees had a net gain of 1.86 million new jobs. Large firms with 500 or more employees lost more jobs than they created, for a net loss of 181,122 jobs. Source: U.S. Dept. of Commerce, Bureau of the Census information on employment dynamics by firm size from 1989 to 2004. DeliveryMaxx pledges to conduct business ethically, provide opportunities for motivated individuals who desire to make a difference in the world, and create a great place to work. DeliveryMaxx will continue to provide a great service to companies that wish to grow their business and increase customer satisfaction. DeliveryMaxx desires to help improve the economy administering these sound principles. In addition to helping small businesses thrive in today’s economy, Mr. Deaton and Mr. Schaefer also believe in employee satisfaction. Employee satisfaction can be measured many ways, and one of the ways it is measured is by an employee’s quality of life. The founders believe in giving back to their community and not just with financial support. Small Businesses affect our economy and level of spending. However, Small Businesses can truly allow people to make a difference in today’s world. DeliveryMaxx takes pride in being a small part of allowing all individuals to pursue “life, liberty, and happiness”. those who don’t believe in the value that a social media strategy can bring to any site or business. For those who don’t understand or see the value of social media websites, let’s take a look at the benefits of creating viral content and effectively promoting them through social media channels. Primary and Secondary Traffic. Primary traffic is the large amount of visitors who come directly from social media websites. Secondary traffic is referral traffic from websites which link to and send you visitors, after they come across your content through the social sites. High Quality Links. Becoming popular on social news websites like Digg or Reddit will get you a large number of links, some of which may be topically relevant, some not. A good story can realistically acquire a large number of high quality editorial links, most of which cannot be easily bought. Links = Better Search Engine Rankings. When a website receives a large number of natural, permanent links from trusted domains, it develops authority. Search engines trust it. If you optimize your linkbait and website structure properly, you can easily start ranking for competitive keywords, which will in turn bring in search engine visitors. Do this often enough and your search traffic will undoubtedly increase. In a sense, you are obtaining these quality links through borrowed trust. Many bloggers and webmaster still think that if an article is on the WordPress or Blogger homepage, then it’s probably worth checking out and referencing through a citation link. A new website may find it difficult to gain links from a critical mass that is not familiar with it but a trusted social news resource makes it easier for links to come in, because the community and buzz has somewhat ‘certified‘ the value of the site. Note that the actual strength of the article is still of utmost importance for all. Primary + Secondary Traffic = Community/Supporters. Some people claim that social news websites only send useless traffic, visitors that will often just view a specific webpage and click away. Yes, that’s usually the case. Sites like Digg are notorious for their poor bounce rates: many visitors drop in for the article and then leave after reading it. StumbleUpon is much better in this aspect. But don’t mistake this with a lack of interest. Your subscriber figures will often take big jump up and then stabilize after a few days. If your entire site is relevant to the general interests of the social media website, there will always be a handful of social users who will start to track your site in order to submit future content. Detractors also ignore the power of ultra targetedsecondary traffic. General sites or blogs in the same niche will link to a story that’s popular on social sites, because it adds value for their readers or users. This is done naturally on a daily basis for many. While primary traffic usually comes in a larger volume, one could argue that secondary traffic is more valuable. Why? Because links from other websites bring visitors who are very likely to be interested in your content. These citation links demonstrate recognition of your site in the eyes of others. It builds your brand. Think of the social news site as a platform or a soapbox. As something that gives you a chance to be heard or read, even for a brief moment of a few hours. The people who are drawn to your message will visit your site and recommend it to others. Why bother exploring social media as a marketing channel for your website or business? After all, you could stick to link exchanges, search advertising or the purchase of banner and editorial ads on relevant sites. It’s low-cost/high returns. If done by yourself, costs are limited to only time and perhaps the expenses involved in hiring a freelance programmer/designer. The benefits will often exceed the cost. It would take you thousands of dollars to buy many links; social media has the ability to give you that for free. So How Does Social Media Help Me to Make Money? It doesn’t, at least not directly. Every site or business that wants to expand and become profitable, needs a core group of supporters who will be willing to make purchases or recommend the site to others. Your site needs to perpetuate itself. The more supporters you have, the faster word spreads about your site. Social media marketing is an excellent way to get people to come into your site to take a look at what you have to offer. You will grow when there are a group of loyal visitors ready to always act upon what you have to offer. Because social media websites can be leveraged for links and better search rankings, they can greatly increase your site’s income potential. For example, you will be able to price ads higher or generate revenue from any paid business models. There are many ways to build a popular blog and many methods to promote your website. For example, you can start leaving comments regularly on many high traffic blogs in your niche or perhaps, consider guest posting on other bigger blogs. My marketing strategy for blogs is very simple. I don’t comment actively, hold contests or write guest posts. I’ve never done any of that for any blog I’ve ever set up. Some people might enjoy doing it but it’s just a little too tedious for me. What I do instead is strategic. I focus on creating just oneexcellent blog post, which I will then push through social media sites and email pitches to other bloggers. This is straightforward and I don’t have to run around many blogs putting up my URL and thinking of something insightful to say. Think about it. Why write 50 guest posts for 50 different blogs when you can easily just write one article and get an equal amount of links and greater traffic through the use of social media? Guest posting builds relationships but I reckon there are many more powerful ways to network with others. It isn’t just about creating articles and then promoting them on social sites as an afterthought. It’s about putting social media in the center of your marketing strategy, optimizing your site or content and making it an attention magnet. Understand the numbers. Don’t join a social network simply because they say they have X number of members. Those numbers mean absolutely nothing. What you should care about is not the total membership, but instead the “active” membership (and those specifically within your target audience - it goes back to targeting). Get to know a network’s policies on promotion, as it applies to your plans. The last thing you want is to be labeled a spammer. Understand that these tools are more about networking, building relationships, and communicating than blatant promotion, as in marketingand sales. No matter how deep you decide to delve into social networking and / or microblogging, always make sure you’re making the best use of your time, and reaching your intended targets. 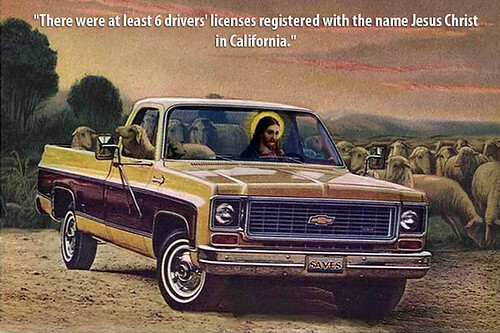 Jesus Christ, a photo by DeliveryMaxx on Flickr. Windshield-Wipers, a photo by DeliveryMaxx on Flickr. Prior to the manufacture of Henry Ford's Model A, Mary Anderson was granted her first patent for a window cleaning device in November of 1903. Her invention could clean snow, rain, or sleet from a windshield by using a handle inside the car. 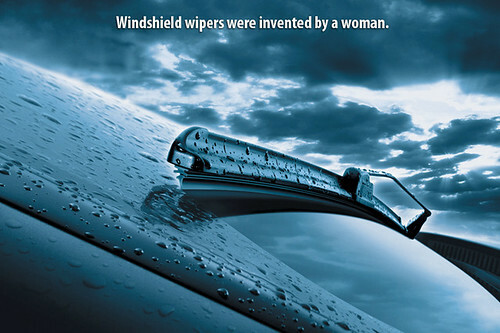 Her goal was to improve driver vision during stormy weather - Mary Anderson invented the windshield wiper. During a trip to New York City, Mary Anderson noticed that streetcar drivers had to open the windows of their cars when it rained in order to see, as a solution she invented a swinging arm device with a rubber blade that was operated by the driver from within the vehicle via a lever. The windsheld wipers became standard equipment on all American cars by 1916. Rolls-Royces-in-Hong-Kong, a photo by DeliveryMaxx on Flickr. 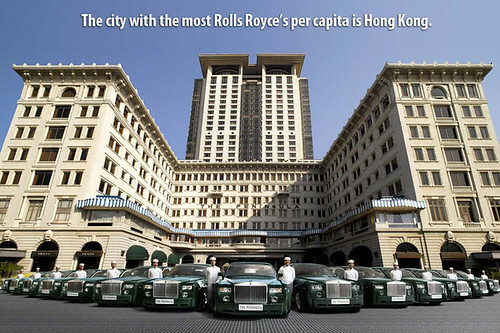 The city which has the maximum number of Rolls-Royce luxury cars per capita in the world is the city-state of Hong Kong, which has been a part of China for the last decade. In fact, it has been confirmed that Hong Kong is currently in the position of the market leader for luxury cars in the world and it is due to this reason the Rolls-Royce Motor Cars Hong Kong opened its first showroom in the Central district of the city-state of Hong Kong on July 30, 2003. Ferrari-Cars, a photo by DeliveryMaxx on Flickr. In just about any discussion of high-end sports cars, you can pretty much count on the mention of one manufacturer in particular: Ferrari. The iconic Italian brand is practically synonymous with flowing, sinewy body contours, racing-bred technology, painstaking craftsmanship and high horsepower. cost you. A brand new Ferrari California would set you back around $192,000 as of mid 2010. One reason is that they don't come streaming off the assembly line every few minutes like the typical Toyota or Ford models do. 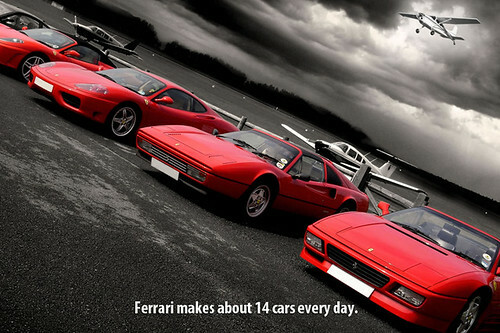 Despite modern manufacturing and efficiency practices, Ferraris aren't made exactly like mass-market vehicles. 1931-Bugatti-Royale-Kellner-Coupe, a photo by DeliveryMaxx on Flickr. 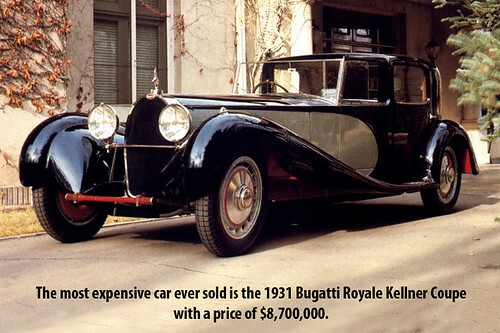 The 1931 Bugatti Royale Kellner Coupe was sold for $8,700,000 in 1987. However, that car and many alike will not be included in this list because it is not available on the market today. It is hard to imagine someone would actually spend 8 million dollars on a car instead of using it for something more productive. However, if you had the money and opportunity, you would probably spend a small fraction of it on a collection of supercars for your private garage. Midnight-Rider-Limousine, a photo by DeliveryMaxx on Flickr. 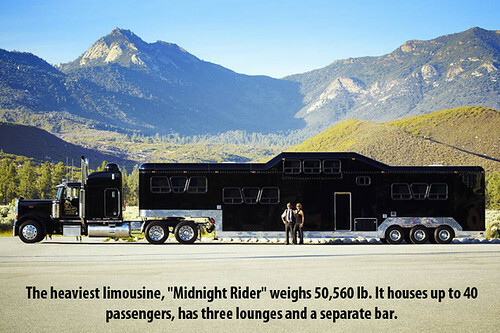 The Midnight Rider is the World’s Largest and Grandest Limousine boasting 460 square feet of pure luxury and is reserved by those who expect the very best. In fact, she is a traveling celebrity vehicle in her own right, based in Southern California and licensed to travel anywhere in the United States. Representative of the luxury days of railroad travel, she is classified as a “Tractor-Trailer Limousine", and is the only one ever built. The air-ride suspension makes for a ride so smooth and comfortable, it allows you to stand up and move from lounge to lounge, dancing, mingling and partying with your group. Car-Radio, a photo by DeliveryMaxx on Flickr. The designer stereos available in today’s cars—be they luxury sedans or cheap sporty coupes—have 80 years of development behind them. 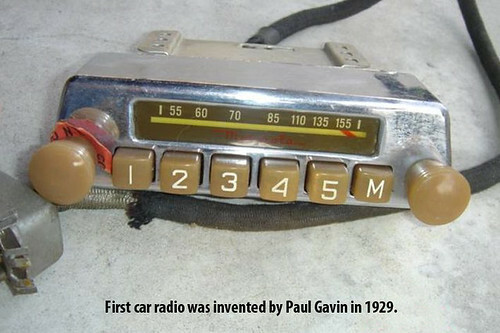 Here’s a look at the landmark advancements in car radios that evolved into today’s iPod hookups and satellite radio. The Galvin brothers’ expensive $130 unit (a Model A Deluxe coupe cost $540) was the first commercially successful car radio, and the first product to wear the Motorola name. Deployed-Airbags, a photo by DeliveryMaxx on Flickr. The National Highway Traffic Safety Administration says that, as of September 1, 1998, air bags have saved 3,448 lives (2,954 drivers, 494 passengers) since they were first installed in quantity in the late 1980s. 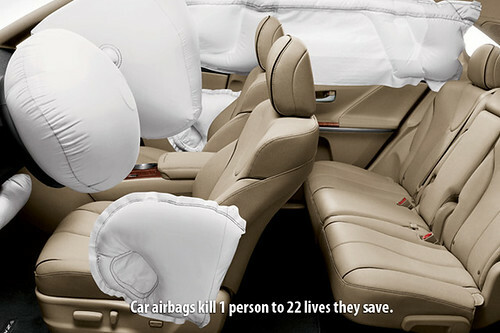 During the same period 115 people (66 of them children) have been killed by air bags, with another 40 unconfirmed deaths, for a total of 155. So we're talking 22 lives saved for every one lost. It's estimated that air bags reduce the risk of dying in a direct frontal collision by 30 percent. Starbucks-Coffee, a photo by DeliveryMaxx on Flickr. 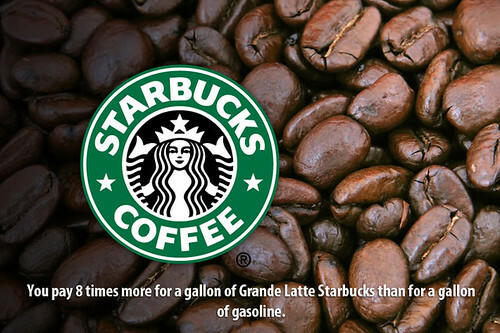 I think most people just dont pay that much at the gas pump.. about $40 a week if you follow the statistics.. and lots of people are now averaging about 30mpg with modern smaller cars. What is that.. 8 starbuck lattes? Distance-Between-Earth-and-Sun, a photo by DeliveryMaxx on Flickr. r hour the trip would only take us 1 million hours." How long is 1 million hours? One year is 365 days times 24 hours per day, or 8,760 hours. 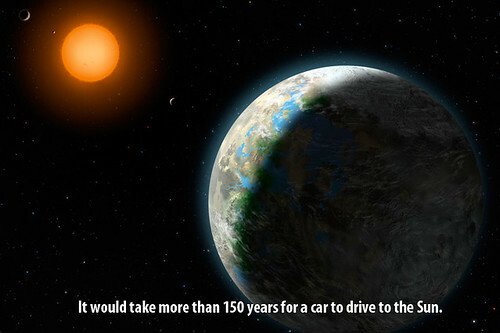 One hundred years would be 876,000 hours, still a little short of the 1 million hour drive time -- so the Sun is really quite far away. Christopher is not impressed, but as he grows older he will be. You've got to be impressed by something that's 93 million miles away and still hurts your eyes when you look at it!